There are a vast number of things that aloe vera helps with, especially when applied to your face and skin. Here, we’ve researched and reviewed a ton of different gels to bring you the best ones that can be used right on your face for moisturizing and soothing irritation. 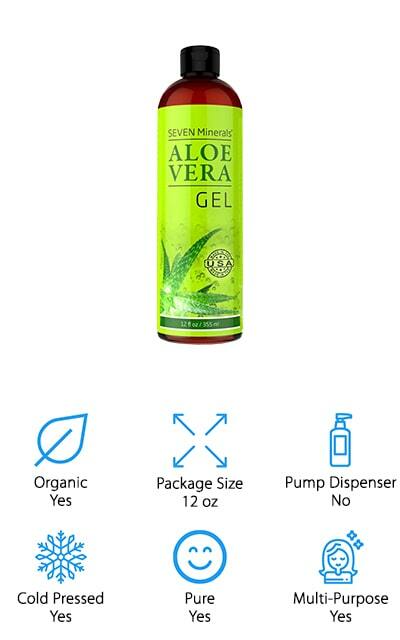 Before we can start looking at the gels, here are some things that you should know while you’re shopping for aloe vera gels. Organic: Is the gel organic? That means that it’s made with completely natural ingredients and doesn’t contain anything that isn’t sourced back to a plant. There’s no chemical processors, preservatives, or other ingredients in an organic gel. Package Size: It’s important to know how much you’re getting in any particular package so you know when you might have to repurchase the container. It will generally tell you how long it will last, depending on how much you use. 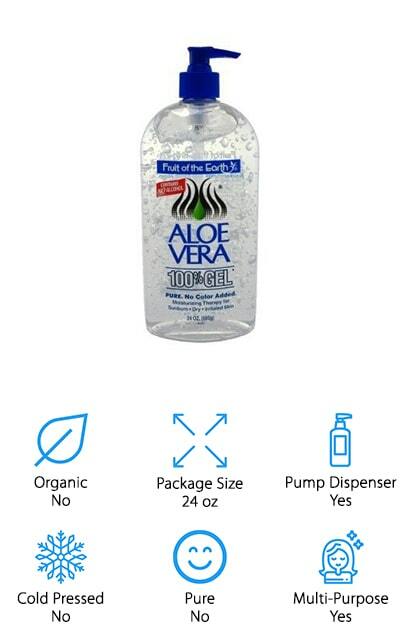 Pump Dispenser: A pump dispenser can make applying aloe vera gel a lot easier than trying to scoop it out of a container or use a pop-top style dispenser. Pumping the gel out makes less of a mess, as well! Cold Pressed: A cold-pressed gel is made in a natural, hydraulic-assisted process that uses pressure to extract the contents from the aloe leaves. This means that you’re getting more nutrients, as heat doesn’t get a chance to destroy them in processing. 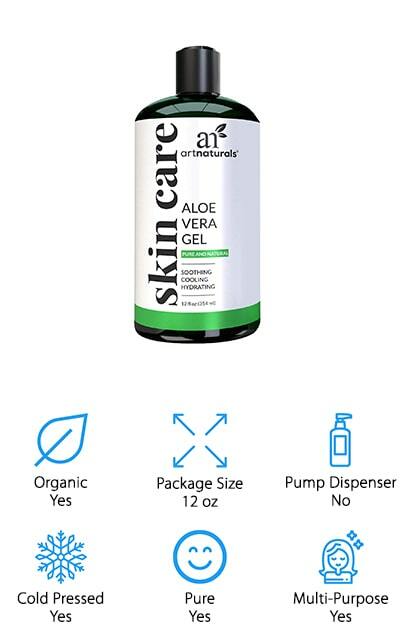 Pure: Pure aloe vera gel is made with simple ingredients, and should mostly consist of the aloe itself. 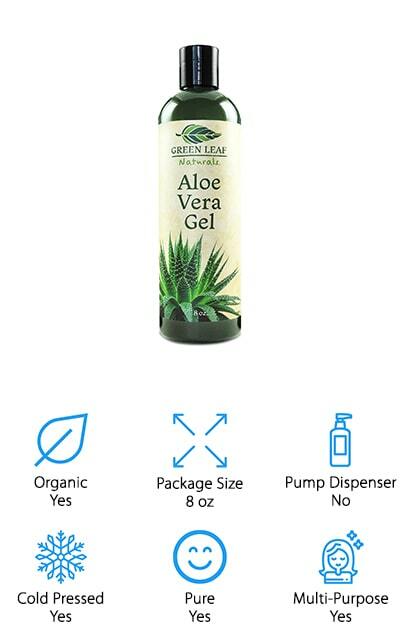 Smaller amounts of other natural preservatives can be added, but pure gels usually contain up to 99% aloe leaf extract. Multi-Purpose: Can the aloe vera gel be used for more than one purpose? It’s important to know if you can use it in your hair as well. All aloe vera gels for facial use are okay to use on your skin. Now that you know all there is to know about aloe vera gels, we can get to the aloe vera gel for face reviews. We’ve searched far and wide to bring you only the best products that you can use to soothe the skin on your face. The top pick and budget pick are our favorites, but take a look at the rest of our list as well for some great gel products. Our choice for the best organic aloe vera gel for face is this one by Seven Minerals. It’s a multi-purpose gel, which means that you can use it on your face, nails, and even in your hair. It works to help improve the feeling of your skin after shaving, sunburns, rashes, and bug bites. It’s a thinner gel than some of the other gels on our list, which means that it works well with whatever application you use it for without becoming sticky or applying too heavily. 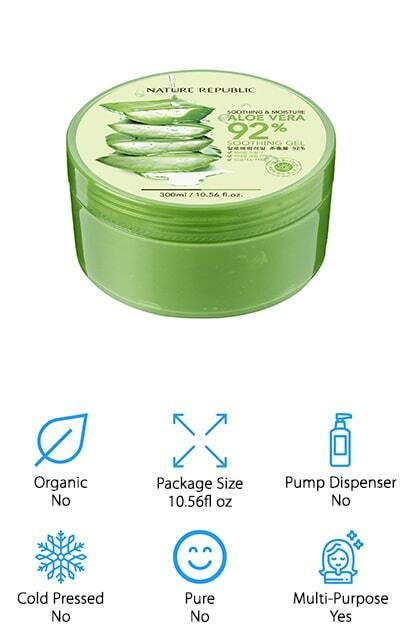 It’s made from aloe leaves instead of powder, which makes it a pure product and also lends to its thinner consistently. Since it’s so pure, they recommend trying it on a different patch of skin before trying it on your face to make sure you have no sensitivities. It’s source in the USA and made with a cold-pressing method that leaves it pure and cuts down on preservative ingredients. Nature Republic’s gel is a great fresh aloe vera gel for face and body. This gel is affordable, first off. This allows you to get the most for your money, especially useful if you’re going to be using it all over your body and in your hair. You can totally do that with this gel because it’s made for use anywhere. It’s rich in several different vitamins that contribute to making your skin feel great. After a sunburn, cuts, or rashes, aloe vera helps to soothe your skin. This particular aloe vera gel has been verified to have between 90 and 92 percent pure aloe from real aloe leaves, which makes it a great choice for someone who prefers natural alternatives. It won’t leave your skin feeling sticky, but absorbs quickly and helps to relax inflamed skin. It comes in a 10.5-ounce container so it will last - a little of this goes a long way! Amara Organics makes this natural and organic aloe vera gel for face, body, and hair use. You can use it after you shave to ease razor burn, or as a way to keep your hair in place. It also works great as a leave-in conditioner for your hair, to keep the moisture right where it belongs. This goes for your skin and cuticles as well - staying moisturized is extremely important, and this natural aloe vera gel for face and body will definitely help you do that. It’s a thin gel that absorbs quickly and goes on smooth, without heavy deposits. An added bonus that this gel offers is use on your pets. If they have itchy places or dry skin, they will benefit from aloe vera as well! Your skin will be silky and smooth after you use this gel to soothe your burns and cuts. It won’t leave your skin feeling sticky like some other gels do. 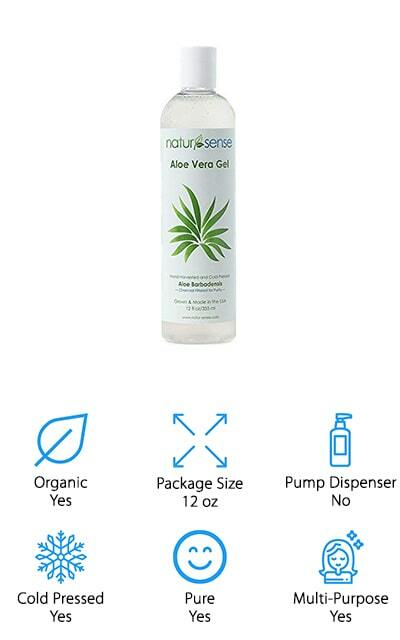 NaturSense makes this pure aloe vera gel for face, body, and hair use. It’s 100% pure and organic, and you’re going to love putting it on your skin. The gel and the bottle are eco-friendly - and the bottle is even BPA-free! It’s filtered through charcoal to lift impurities and cold-pressed to further ensure that this formula is entirely pure. As a result, you’re getting a high volume of vitamins, minerals, and proteins that make aloe vera so desirable to treat your skin. Instead of coming in a thick gel, it’s got a great liquid texture that will help you apply it evenly and without heavy deposits of gel in any one location. In fact, it applies smoothly and with a silky consistency. It’s free of any thickeners and fragrances. We know that you’re going to love this nature’s cure for all of your different skin issues. This aloe gel was created with purity and comfort in mind. Green Leaf Naturals makes one of the best pure aloe vera gels for face or any other part of your body. You can use it as an aftershave, a daily moisturizer, and to treat different skin irritations and cuts. It’s 99.75% pure so you know that you’re getting the best. The only additional chemicals present in this gel are natural preservatives so you can keep it on your shelf. Otherwise, it’s made from organic aloe vera plants and cold-pressed for the best concentration of vitamins and minerals available. It’s a thin formula that spreads evenly, giving it a better chance to penetrate your skin rather than sitting on top of it. It’s not sticky or gooey and won’t leave a residue on your skin. 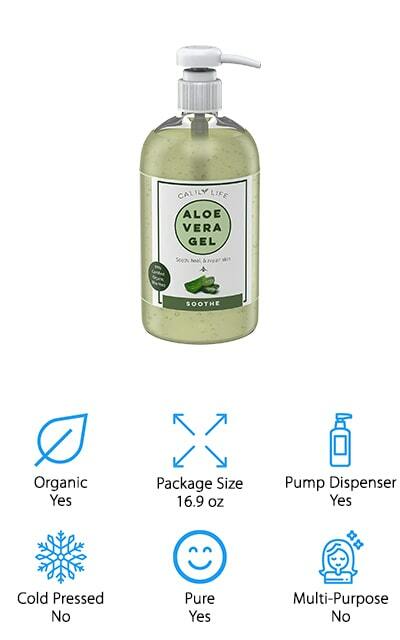 You can even use it for DIY products that include aloe vera! This gel is free of any dyes, alcohol, or parabens, and it’s safe for your kids and pets as well. Aloe vera is one of the best natural curative moisturizers, and this gel from ArtNaturals is definitely one of the best ways to get it! This aloe vera gel is organic, made with completely pure and natural ingredients. It’s been through a cold pressing process so that you get only the best and most highly-concentrated amounts of certain vitamins and minerals. You can use it on your hair or your skin to help soothe sunburns, dandruff, rashes, and dry skin. It’s natural moisturizer! This gel is a thinner formula than some other, goopy gels. It’s meant to leave your skin feeling refreshed and silky, instead of sticky or greasy. This gel absorbs into your skin quite quickly to give you the best results immediately. We love how natural and pure this gel is. 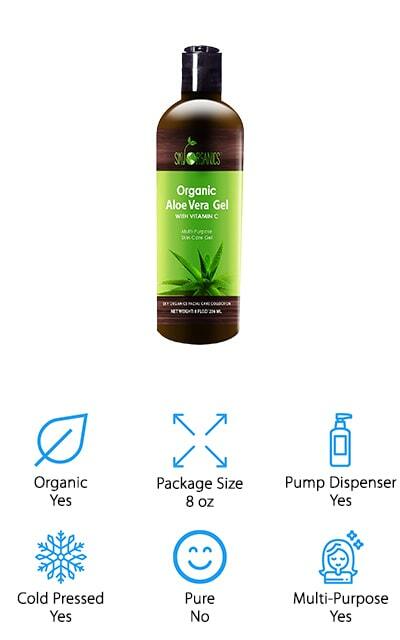 It’s made without any additional colors, alcohol content, or fragrances, so you know you’re only getting organic, pure aloe vera. We love it! This product by Sky Organics is a good aloe vera gel for face use, or for use on your hair and all over your body. It’s 99.5% organic and contains not only pure aloe vera gel but also vitamin C and other natural preservatives. However, it is completely unscented and free of any fragrance and does not include alcohol. This gel isn’t sticky and won’t leave your skin feeling wet or greasy - instead, it penetrates and absorbs quickly to make you feel smooth and perfectly hydrated. You can use it to make your own hair care products, creams, and aftershaves if that suits you. Use it on your skin after you’ve been out in the sun to help soothe burns and damage. It’s great for all manner of skin irritations, even dandruff, and insect bites. Sky Organics even backs their product with a money back guarantee if you don’t like it, so you can give it a try! Holika Holika’s Aloe Gel is made without any artificial coloring or mineral oil, which makes it one of the purest we could find. It gives your skin a great deal of moisture without leaving your skin feeling sticky or It is absorbed fast and freshly without any of the stickiness that comes with some other gels. 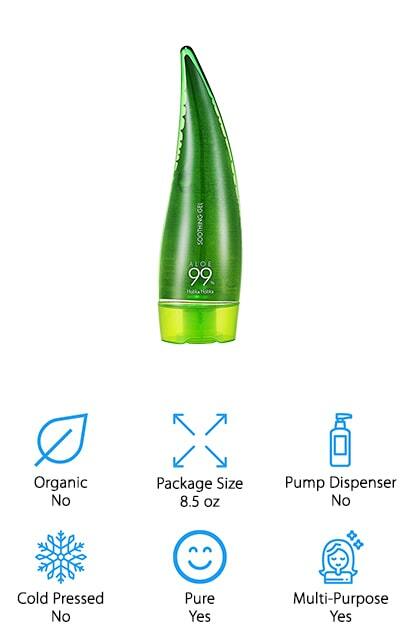 It contains 99% fermented aloe vera juice. The fermentation process allows the maximum concentration of certain parts of the aloe that help your skin feel better and more moisturized. It’s made without parabens, animals ingredients, or anything else you don’t want on your skin. It’s great for soothing sunburns and other minor irritation, as well as leaving your skin feeling moisturized and sleek. We love that this gel is packed with all of the good stuff that you want without containing any of the bad! There are very few things that will help with skin irritation like aloe gel. Fruit of the Earth is one of the original aloe vera gels for face and body use. You can use it on all of your skin that is dry or irritated because it doesn’t contain any alcohol that will burn or hurt your skin. It’s especially great for use on rashes and sunburns because it helps to soothe while it’s moisturizing. 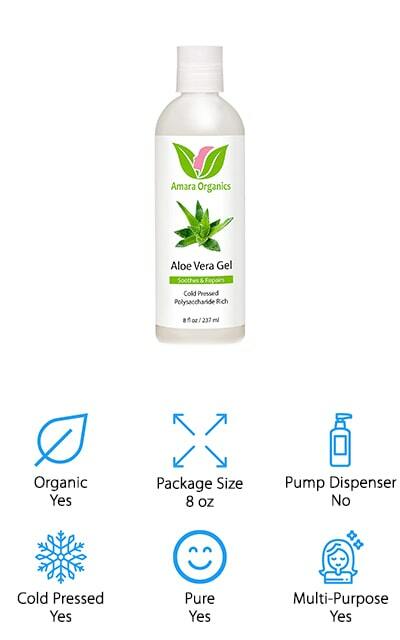 This order contains two bottles of aloe vera, both with pump dispensers so it’s easy to apply. Each bottle contains 24 ounces of gel, so it’s going to last you quite a while. A little of this aloe goes a long way towards soothing your skin irritations. There are no colors or fragrances added to this gel to make it anything other than it is. You’re only getting the best aloe vera gel, and you’re getting enough of it that you can use it for anything! You can even use it to moisturize your hair. Calily Life makes one of the best pure aloe vera for face formulas that we found during our research. it’s an organic gel that works as a natural antioxidant and soothing solution for all different types of skin irritations, including rashes, allergic reactions, and sunburns. It absorbs quickly so it can start working right away and get your skin the moisture that it needs. This gel is loaded with great vitamins and minerals to help your skin feel better. There are multiple different benefits to using an aloe vera gel as a moisturizer, so why not give it a try? This gel is thin and will spread easily over your face and body without leaving any residue when it dries and absorbs into your skin. It’s also been created specifically so it won’t clog your pores when you apply it, and it won’t build up in one spot like some of the thicker gels on the market.